Hi ladies. Happy T Day to you all. Tuesday is time to share your drink related photos or art over at Bleubeard and Elizabeth's blog. So for my drink related photo I have this bottle of wine to show you. Three Sunday's ago I attended the bridal shower for my nephew's wife to be. They are to be married next month. 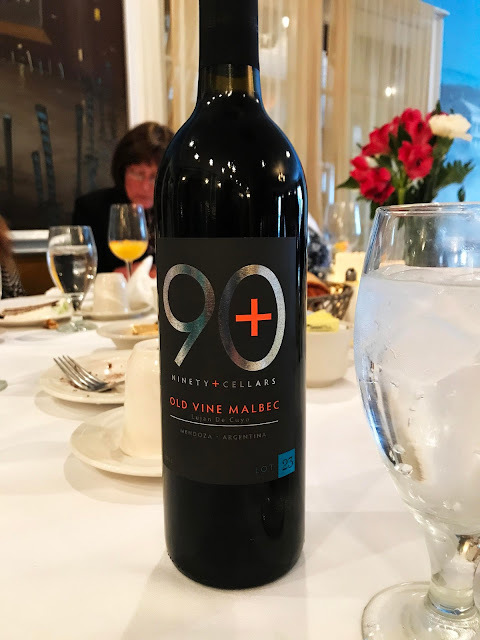 At the shower they played bridal bingo and I was the first person to get bingo, so as a prize I won this bottle of wine. I saved my bingo card (which is completed because I continued to play after I won) and put it into my drawing journal for that day. I haven't tried the wine yet ,but one of these days I'm going to enjoy a big glassful. 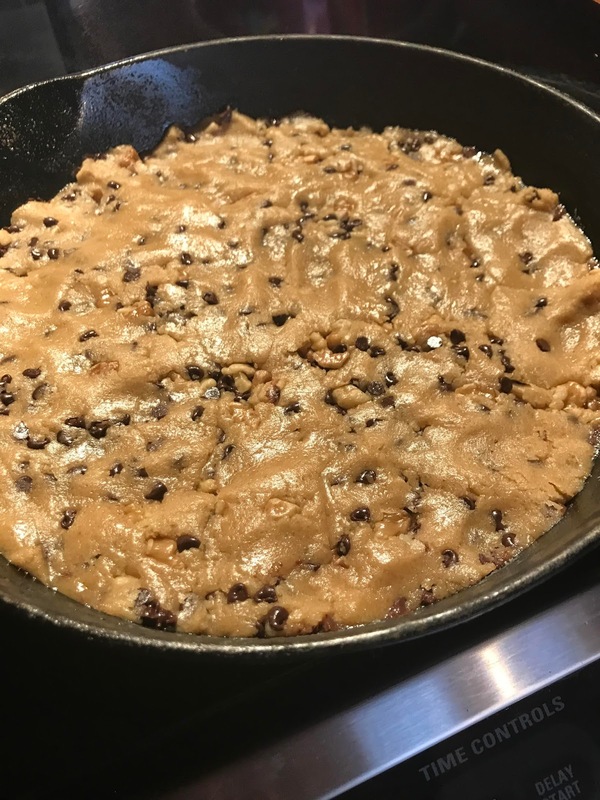 And I tried out Kathy's recipe for chocolate chip cookies in a cast iron pan this past weekend. 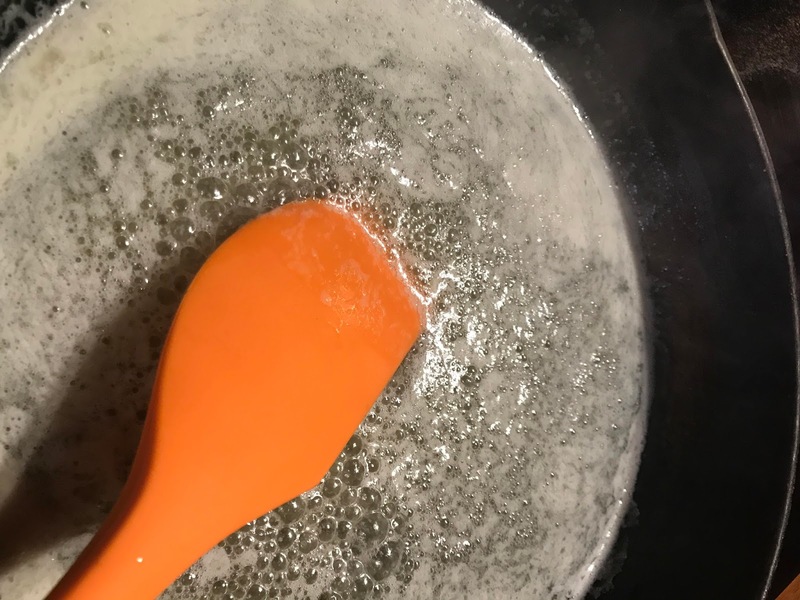 I printed the recipe she used from America's Test Kitchen, and began by browning some of the butter. Then I mixed the batter and spread it in my cast iron pan to bake. They came out great and it made my husband happy since chocolate chip cookies are his favorite..
And I enjoyed trying something new. I got to use my cast iron pan, which was actually my grandmother's! It got me thinking about her and remembering her with a big smile. Stop of over Hummingbird Woodland Studio to check out Kathy's blog. 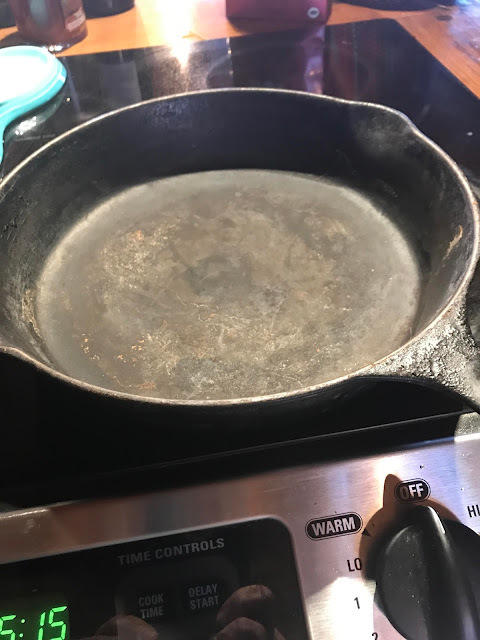 I'm going to link up to her cast iron Friday post this week. And lastly today I have a recycled collage for Alison's challenge at Art Journal Journey. It's another page from my Night Sky/Space journal. I used several photos from an old atlas, as well as these circle dots I made by printing a photo of one of my Gelli prints on a circle sticker sheet. I thought they looked rather like abstract moons. Hope everyone has a fantastic T day and thanks for visiting my blog today. Hi Erika, I loved your collage page, and congrats on winning the bingo for the bottle of wine-and that is nice to have the bingo card for your journal. and I am soooo excited that you made the cast iron chocolate chip cookie bars. I feel that way too when I pick up a kitchen item that was my Grandma's. my Mom;s or my sisters-makes me smile too like they are right there with me in the kitchen. You'l have to let us know how the wine was:) I agree that the big cookie in the cast iron pan is delish-the same recipe I used a few weeks ago from Cook's Country! Love your space journal pages-those abstract moons are so cool! Wishing the snow away for you and me....happy T day! totally LOVE your moon journaling!!! and i wonder if i can make these cast iron recipes without cast iron;) your result looks so yummy! cheers to you, enjoy the wine! happy t-day! Lots of yummyness, and that wine prize looks very interesting Erika! I love your collage spread too, thanks for sharing it with my challenge at AJJ. I am not familiar with bingo at all but I know that I have "bingo-wings" and so I think if I would play bingo I would be a good bingo girl... congrats on the win! A bridal shower...wow. Sounds fabulous! Hope this event whetted your daughters appetite to wed as well! Your big cookie looks so yummie and I can imagine that the pan brought memories of your grandmother, if the pan is even from her. I always think of my "Oma" at so many occasions, more than of my mother. I think my grandmothers and my grandaunt were more my mothers than my mum was - she was simply tooo young as she got me. ( just 18) And this was the reason I got my daughter so late I guess. 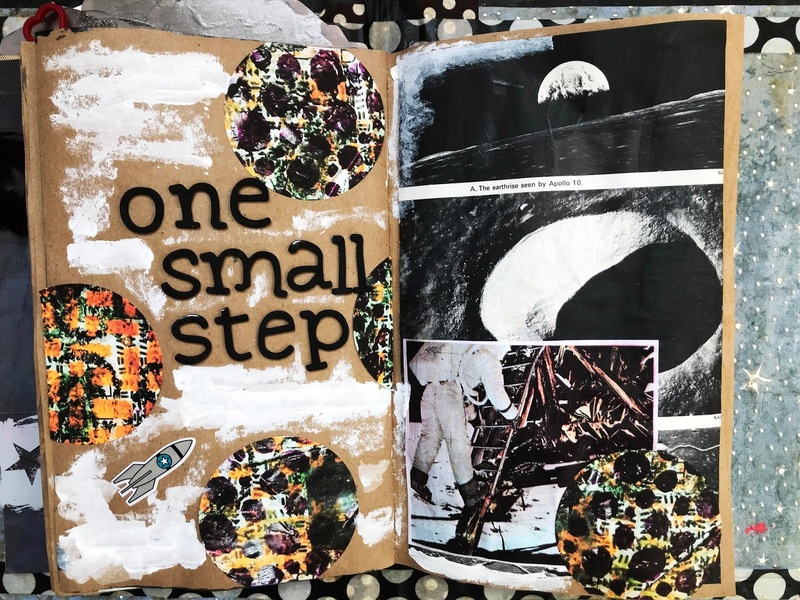 The ONE SMALL STEP collage spread is absolutely A*M*A*Z*I*N*G ----wow - extra cool and artsy and it reminds me of this big event that I saw at television as I was not even 6 years old, but it was something so special for all people that I remember it so well! Thank you for a fantastic entry for Art Journal JOureny and Try It On Tuesday dear Erika! Happy T-DAy and happy rest of the week! We have heavenly spring weather and I just enjoy the garden ....so good for the winter soul in me. Good on you, winning the bingo! And that cookie looks terrific -- America's Test Kitchen recipes never fail, although after last weekend's cooking debacle, I'm iffy on using pans/skillets in the oven. It was fine when I pulled it out but I should have left the potholder on the handle. Fortunately, not too much blistering but it was terribly "hot" for a while, even soaking in cold water! Be careful with that! Fun post, Erika. You won a prize, baked a marvelous cookie and made a great collage page for AJJ! I'm very tempted to try that cookie recipe, but I'd have to borrow a cast iron pan. It looks so delicious every time I see it on one of Kathy's followers' blogs. An awesome spread in your night sky journal, the gelli prints and images all go so well together. The bridal shower sounded fun, I'm sure you will enjoy you glass of wind and remember the day out you had. I liked the look of your yummy cookies, yummy to have with a cuppa. Happy but late T day wishes. Your space journal is stunning! The cast iron cookies sound yummy too...happy T day! Your cast iron cookie looks amazing! I have got to try this. I am loving your journal page with all of it's abstract circles. A wonderful spread! I had planned to be here sooner, but my keyboard had other plans. Also I left you a long message and my keyboard chose to delete it. I'm bummed. 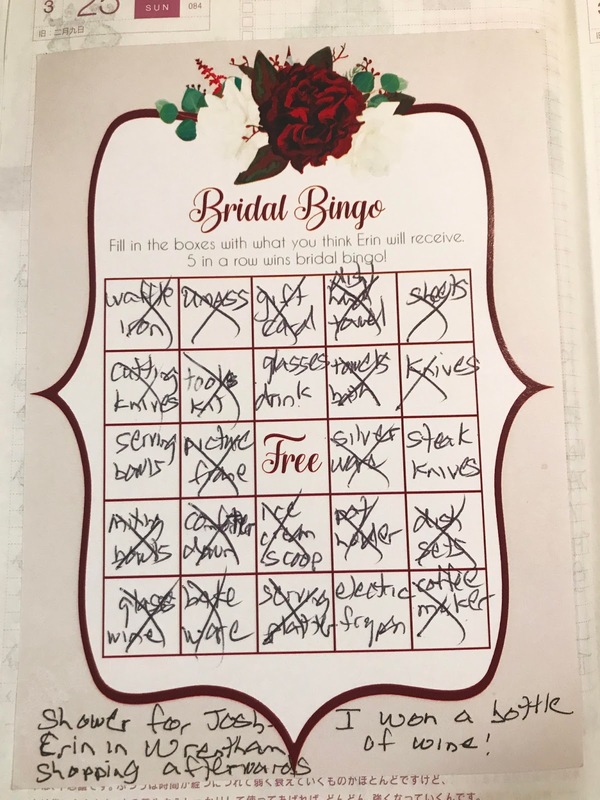 I thought the Bridal Bingo was genius and a great way to break the ice. You won a fabulous prize, too. I'm so glad you are joining Kathy on Friday. Your chocolate chip cookie looks wonderful. I plan to in May. I am especially impressed with your lovely AJJ entry. I am a big fan of anything space related or with space travel. It's a great entry and I was so pleased you shared it with us at Art Journal Journey. Even though I am not a wine drinker, you got a fabulous prize for playing Bridal bingo. It's a beautiful entry for T this Tuesday, too. Congratulations on winning the wine! Good idea to put the bingo card into your daily drawing journal! 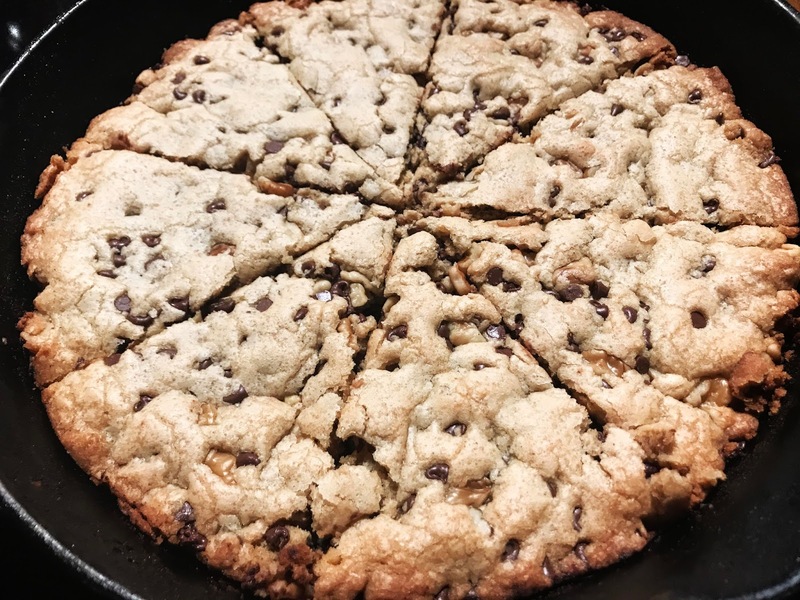 Your chocolate chip cookies in that iron pan look gorgeous and surely taste yummy! And you remembered your grandmother with a big smile while cooking with "her" iron pan - it's just heart warming! Your page from your Night Sky/Space journal (interesting you have such one) is fantastic! I like how you used your gelli-prints as circle stickers, they are wonderful! Sorry, I am behind with commenting - but we have warm weather and so I was working in the garden the last days. I am so late at getting around to visit everyone!!! Thanks so much for stopping my my blog ♥ I have been super busy here with adjusting to the new resident but mostly because the sun has finally come out and warmed things up . At least for a few days before the cold comes back. But I have been out in the yard cleaning up things that didn't get done in the fall. Your cookies look so yummy and I love the collage you did too. The bridal shower sounds fun and the wine looks like it will make for a fun evening sometime.